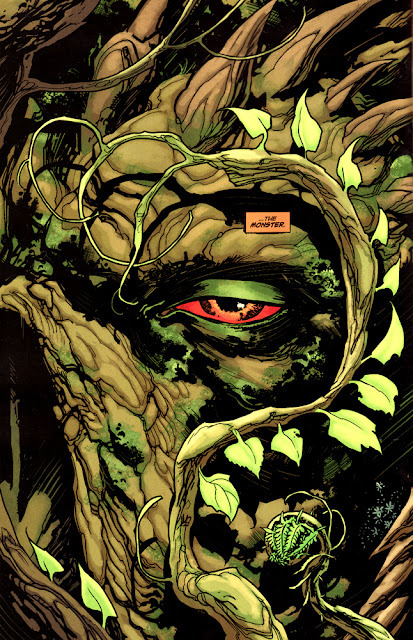 While that wasn't too far from what I looked like in the bathroom mirror this morning, the all-new look Swamp Thing will be revealed in full next month! Yanick has defined his career on this book. His page layouts are so Steranko-like in creativity, their nature focussed designs breathe themselves, leading to the designs between the panels almost being as good as what's contained within them. This page might not showcase that particular skill, but still, just look at that detail! Lovely eye for detail. And really, with Swamp Thing you need that or he ends up just looking like a pile of radioactive goo. Ha - he sure can Random! Yanick definitely proves that theory. Heck he even makes the darker parts of this book look great! Thanks for the comments - always good seeing your icon appear!